COLONIAL AMERICA DISTILLS MOSTLY RUM, USING MOLASSES IMPORTED FROM THE WEST INDIES. THE FIRST EVER AMERICAN WHISKEY ON RECORD IS DISTILLED BY SCOTCH-IRISH COLONISTS. IT’S AN UNAGED RYE WHISKEY. BRITISH BLOCKADE PREVENTS AMERICANS FROM RECEIVING MOLASSES TO MAKE RUM. DISTILLERS IN PENNSYLVANIA AND MARYLAND START MAKING WHISKEY USING DOMESTICALLY GROWN RYE AND CORN. THE FIRST COMMERCIAL DISTILLERY IS FOUNDED. In 1802, just as whiskey consumption in America reached an all-time high, the small town of Lawrenceburg, IN appeared along the banks of the Ohio River. For decades, whiskey production had been thriving in Maryland, Pennsylvania, and, most recently, Kentucky. The next year, the Louisiana Purchase would expand trade into New Orleans, allowing distillers to ship barrels of whiskey to the West and South by steamboat. 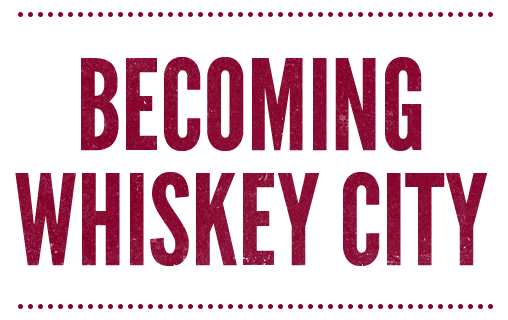 Within the next century, Lawrenceburg would become known as Whiskey City—the rye-distilling capital of the world. Looking back, the events surrounding Lawrenceburg’s birth seem almost serendipitous. America was rife with opportunity for whiskey distillers, especially those with access to the mighty Ohio River. The first mash bills from Lawrenceburg in 1809 were produced in a grist mill powered by a single blind horse. This crude method of grinding grain meant the original Lawrenceburg distillery was limited to two barrels of whiskey per week. By contrast, George Washington’s distillery at Mount Vernon had already reached 11,000 gallons a year almost a decade earlier in 1797. Still, Lawrenceburg was poised for opportunity. Being close to New Orleans trade routes meant that it was a prime location for distilling whiskey. With Kentucky focused on distilling bourbon, Lawrenceburg was primed to take over as the new leader in rye whiskey. With rich farmland on one side and the Ohio River on the other, it was only a matter of time before more Lawrenceburg distilleries began cropping up. POLITICAL UNREST BETWEEN GRAIN FARMERS AND THE GOVERNMENT OVER THE WHISKEY TAX CULMINATES IN THE WHISKEY REBELLION. WASHINGTON SENDS 13,000 TROOPS TO DISBAND THE PROTESTS. IT WORKS. GEORGE WASHINGTON OPENS A COMMERCIAL DISTILLERY AT MOUNT VERNON. IT GROWS TO BECOME ONE OF THE LARGEST DISTILLERIES IN AMERICA, PRODUCING 11,000 GALLONS OF WHISKEY PER YEAR. THOMAS JEFFERSON TAKES OFFICE AFTER RUNNING ON A PLATFORM THAT PROMISED TO REPEAL THE WHISKEY TAX. WHISKEY CONSUMPTION SOARS. THE TOWN OF LAWRENCEBURG, IN IS ESTABLISHED. THE FIRST DISTILLERY OPENS IN LAWRENCEBURG, ITS GRIST MILL POWERED BY A SINGLE BLIND HORSE. SOUR MASH IS DEVELOPED, REVOLUTIONIZING THE PRODUCTION OF WHISKEY, AND REMAINS A STANDARD TO THIS DAY. THE TERM “BOURBON” IS OFFICIALLY USED TO DIFFERENTIATE WHISKEY MADE WITH CORN. GEORGE ROSS ESTABLISHES ROSSVILLE DISTILLERY IN LAWRENCEBURG, INDIANA. In 1847, amidst the golden age of rye, Lawrenceburg’s most important distillery opened its doors. Its name was Rossville Distillery, and for nearly two centuries it has produced some of the finest rye whiskey the world has ever seen. Considered one of Lawrenceburg’s original distilleries, it is the only one still producing whiskey today. Rossville Distillery was founded by George Ross, who selected uncommonly ideal ground on which to build a distillery. Rossville was built directly atop an aquifer, providing the distillery with limestone-filtered water. This prevented sulfur and iron compounds from negatively impacting the whiskey’s taste, resulting in a bold, spicy flavor no other rye producer could replicate. After the repeal of Prohibition in 1933, the demand for rye and other American whiskeys declined as new generations discovered vodka, gin, and wine. Many whiskey distilleries closed their doors, but the original Rossville Distillery remained open, diversifying into other industries while still methodically working to perfect Lawrenceburg’s historic mash bills. LAWRENCEBURG IS WELL ON ITS WAY TO BEING KNOWN AS WHISKEY CITY, WITH NEARLY 20 DISTILLERIES OPERATING IN DEARBORN COUNTY. THE PURE FOOD & DRUG ACT FORCES THE LABELING OF “STRAIGHT” AND “BLENDED” WHISKEY. THIS IS A BLOW TO THE MARYLAND RYE STYLE, WHICH ADDED CHERRY OR PRUNE JUICE TO GIVE THE WHISKEY A SWEETER FLAVOR. THE U.S. CONSUMES 135 MILLION GALLONS OF AMERICAN-MADE RYE AND BOURBON. PROHIBITION BANS THE PRODUCTION AND SALE OF ALCOHOL WITH ONE EXCEPTION: MEDICINAL WHISKEY. LESS-BOLD CANADIAN WHISKEY IS SMUGGLED IN BY BOOTLEGGERS. AMERICANS DISCOVER GIN, VODKA, AND WINE. WHISKEY SALES DECLINE. MANY DISTILLERS RETURN TO THEIR ROOTS AND BEGIN TO EXPERIMENT WITH RYE AGAIN. A CRAFT COCKTAIL REVIVAL BEGINS, CONTINUING TO THIS DAY. RYE WHISKEY BECOMES ONE OF THE FASTEST-GROWING ALCOHOL CATEGORIES IN AMERICA. Rossville Union Master Crafted Straight Rye Whiskeys are a celebration of the historic Rossville Distillery and Lawrenceburg’s mastery of rye whiskey. With tremendous respect for America’s original spirit, we set out to create a rye that combines new American craftsmanship with the soul of 1847. The result is unmistakably bold and unapologetically spirited. The new golden age of rye has officially arrived. INTERESTED IN SERVING ROSSVILLE UNION RYE? LET US KNOW. ROSSVILLE UNION DISTILLING COMPANY, LAWRENCEBURG, INDIANA. ROSSVILLE UNION, THE ROSSVILLE UNION BOTTLE DESIGN AND THE ROSSVILLE UNION LOGO ARE TRADEMARKS, AND/OR REGISTERED TRADEMARKS OF ROSSVILLE UNION DISTILLING COMPANY ©2018 ALL RIGHTS RESERVED.